Toll, or Rose Cottage is a mysterious little cottage nestled inside the modern footprint of the Family Law Court in Bolton Street Newcastle. Its quaint size and simple shape immediately calls to mind the convict era cottage structures that you find have survived all over Battery Point in Hobart. Could this little place be Newcastle’s oldest building, and along with Macquarie Pier 1818 (a.k.a. Newcastle Breakwater), an early surviving relic from Newcastle’s convict past? We have assembled as much historic data as we can currently that relates to either the type of building structure, or the actual structure(s) that appeared in the vicinity of the current location in Bolton Street. If anyone has any further information and imagery please let us know by adding your views in the comments. The overlays of the mapping have been created in Google Earth. Remember, click on all the images to see the high resolution versions for greater detail and examination. T. R. Brown Newcastle in 1807 (Courtesy of the Newcastle Art Gallery) is a painting that depicts the extant cottage and building structures on the landscape at that time. As a reference from now on, please note is the little wharf that begins to appear in the paintings, lies at the end of what is now our Watt Street. From at least 1818, recorded on the Meehan Plan for the construction of Macquarie Pier, it was known as “George Street”. So, to find our little cottage we need to look to the next street to the west for our current location of Bolton Street. Again, at the time from at least 1818, the next street to the west of George (later Watt) Street was known as “St Patrick Street”. Photograph: Bruce Turnbull. Courtesy Newcastle Region Art Gallery. T. R. Browne Newcastle, in New South Wales, with a distant view of Point Stephen, 1812 is an engraving (No.6) which forms part of a panorama with its companion (No.5). Again, click on the images below to see the higher resolution views of the “cookie cutter” building structures just like our Toll Cottage on the early colonial landscape of Newcastle. Again note the number of such structures on what was to become “St Patrick Street”. View of Hunters River, near Newcastle, New South Wales, 1812. Copper Engraving. Nos 5 & 6. Photographer: Bruce Turnbull. Courtesy Newcastle Region Art Gallery. T. R. Brown. Settlement of Newcastle. 1812. Taken from the base of Prospect Hill. T. R. Brown, Pinx Plate 2. (Courtesy of the State Library of NSW). Another view, from a drawing that may have been the study used to create the engraving above. Again note the style of the cottage structures, and those inhabiting what was to become St Patrick Street. James Meehan Esq. Plan of Newcastle New South Wales August 7th 1818 By James Meehan Esq. Dep. 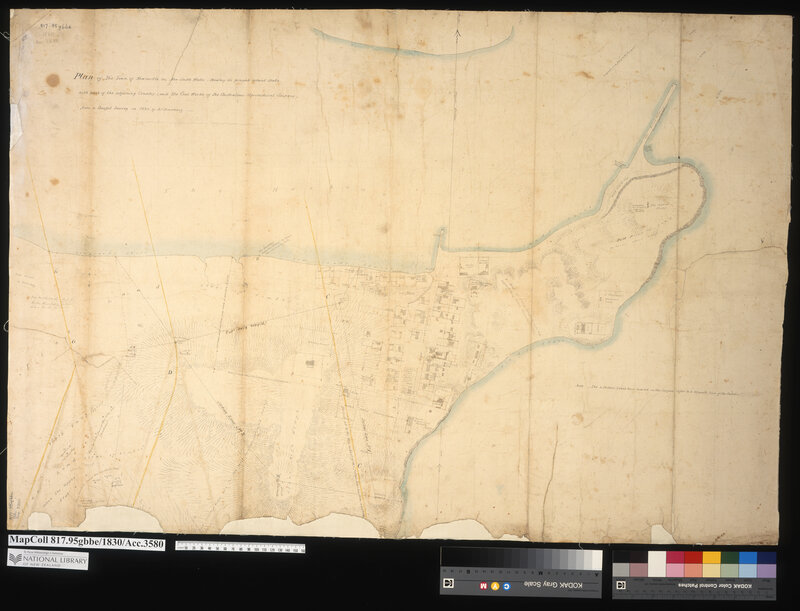 S. Gen. (AO Map 83 Courtesy of State Archives and Records NSW) shows the original streetscape of Newcastle in 1818. Note that our current Watt Street was George Street, and the street immediately to the west was St Patrick Street. The overlay of the vicinity of 51 Bolton Street is below to clarify. No structures are shown on the site according to this plan. Henry Dangar. Plan of the Town of Newcastle on Hunters River. circa 1823? AO Map No. 4398 (Courtesy of State Archives and Records NSW) shows the site of 51 Bolton Street as occupying allotment 37. Allotment 37 is listed as belonging to “A. Beveridge” on Dangar’s “Names of Persons who have orders for Town Allotments”. No structures are shown existing on that site. Edward Charles Close. Newcastle Panorama circa 1821. The Panorama (reconstruction from the original paintings by the University of Newcastle) above is constituted of the following paintings in Sketchbook of scenes of Sydney, Broken Bay, Newcastle and region, New South Wales, 1817-1840, (Courtesy of the National Library of Australia) once attributed to Sophia Campbell, now Edward Charles Close, 1790-1866 (Thanks to Mark Metrikas for identifying this find) The individual paintings that make up this Panorama from the Sketchbook are listed in order from left to right: (1) Commandant’s house from in front of the old gaol, Newcastle, New South Wales, ca. 1828 [picture] (2) Dwellings, fenced land and the windmill on the hill, Newcastle, New South Wales, ca. 1820 [picture] (3) Barracks with Christ Church in the distance, Newcastle, New South Wales, ca. 1820 [picture] (4) Dwellings and buildings in Newcastle, New South Wales, ca. 1820 (5) View over buildings towards the signal mast and Nobby Head, Newcastle, New South Wales, ca. 1820. Sir Thomas Livingstone Mitchell (1792-1855). Sketch of Newcastle in 1828 from Field Book – Port Jackson and Newcastle, 1828 (C 40)(Courtesy of the State Library of New South Wales). A detailed comparison of extant structures in Bolton Street in 1828. Is our cottage in the view? Sir Thomas Livingstone Mitchell (1792-1855). Sketch of Newcastle in 1828 from page 28 in Field Book – Port Jackson and Newcastle, 1828 (C 40)(Courtesy of the State Library of New South Wales). The document above forms a suite of papers located at the State Archives and Records NSW Authority in Sydney relating to Newcastle’s public infrastructure in 1829. It is important as it lists details of all public buildings including a number of cottages in Bolton Street. See especially those numbered from 18 to 23 as possible contenders for our original Toll Cottage. Details recorded by Rodd relating to a number of Cottages located in Bolton Street Newcastle in 1829. John Armstrong’s 1830 plan is generally regarded as a very accurate record of what was on the the Newcastle landscape at that time, and should be compared in context with Rodd’s 1829 Return as well as Sir Thomas Mitchell’s 1828 sketches. At the location of 51 Bolton street appears a structure labeled as “Govt cottage out of repair”. I created an overlay of the Armstrong Plan with Google Map (as at April 2018). My opinion is that the present “Toll Cottage” is not the one depicted in the Close and Mitchell renditions. The cottage building (identified as “3” in blue on the central image) above is rectilinear, with a hip roof with the ridge running north south (as are just about all the small cottages depicted). Toll cottage is near enough to square with a gable roof and a ridge line running east west. It also has a loft floor which doesn’t appear to feature in any of the cottages in this area depicted in the early paintings. Since this cottage, and other Government buildings, were noted as being in “poor repair” (see 1828 Rodd Return, and on the Armstrong 1830 map), it could be assumed that shortly after this time the building was either reconfigured, or torn down and built anew from salvaged materials. The act of building, and then demolishing, seemed to be a common practice where repair was deemed nonviable. Some buildings may have become the victim of the encroaching sand drifts close to the beach after some of the vegetation in that area had been removed, as they don’t appear to be found in Sir Thomas Mitchell’s 1828 sketches, whose survey work, incidentally, I trust to by 100% accurate. Perhaps the “Toll Cottage” was a new-build for the Commissariat’s Clerks after the need for repair to existing (and other new outbuildings required) made it more viable to begin afresh? The Town of Newcastle and its Harbour (in 1844) shows the site of 51 Bolton Street as occupying the area between two allotments 47 and 49. A pencil version of a plan from the same era, [Town of Newcastle, New South Wales] see: https://trove.nla.gov.au/work/16818033 reinstates the location as between allotments 37 and 39, as it appeared in the Dangar 1823 plan. So could the cartographer of the 1844 plan The Town of Newcastle and its Harbour (in 1844) (see: https://trove.nla.gov.au/version/19739356) have made a mistake with the numbers? It also states the possible owner of the land as “Kemp” (Simon Kemp?). An 1845 map of Newcastle, held in the Local Studies section of Newcastle Region Public library identifies the allotment 37 as being now owned by an “A. Beveridge” and allotment 39 as “D. Maguire”. John Rae, 1813-1900. Newcastle in 1849. (Courtesy State Library of New South Wales). Click for the FULL image. Charles Martin states: The 1849 panorama above was drawn from the veranda of Claremont House, and it is from there that a sight line to present day Toll Cottage can be established. Its location should be just behind the Wesleyan Hall. It is interesting to note that that the other two cottages (to the south) that were there in the 1830 Armstrong plan appear to have been removed, as well, it would seem all other similar simple dwellings of the early 1800’s, being replaced by larger and more substantial structures. Could it be that what is there today in 51 Bolton Street was built at around the same time as the other buildings that appear in the later c.1880 photographic panorama taken by Rae? Charles Martin continues: I have tried to locate exactly where Rae may have positioned himself to attempt the panorama. Since it is reasonable to assume that the Wesleyan Hall was on lot 49, then, by using the ridgeline, once could conclude that Rae was sited on the very southern end of the Veranda. By drawing sight-lines from here to the existing Toll Cottage, it would appear that it (if indeed it did exist by then) it would wholly be obscured by the Hall. Thus, I think we can’t be assisted by Rae’s fine painting as to the existence or otherwise of Toll Cottage on this site in 1849. The Google Map’s property boundaries are pretty correct, but some of the present day building footprints are a bit out in places. However Claremont House is pretty correct, and the Wesleyan Hall would have occupied the site where a free standing terrace house now stands. I surmise that Toll Cottage may have been built sometime in the 1860-80 period, and not be the continuing structure from the 1820s as previously assumed. Another question is whether the Wesleyan Hall (in Rae’s 1849 panorama) and the Lyceum Hall (see 1890 photo below and 1889 image from the Illustrated Sydney News) were the same building, and if that may have altered Martin’s conclusions as to where Rae may have been located for his panorama on the Claremont House first floor veranda (north or south? ), and whether he may have been able to view the Rose Cottage site? Martin has come to the conclusion that they were not the same building, although having a very similar elevational appearance. The Wesleyan hall is smaller (in width and height) than the Lyceum Hall, which is simpler in its detailing, is set back from the street boundary, and is clearly close to the southern boundary of the Wesleyan Church’s two adjoining lots. The Lyceum Hall is located further north. See image below. Therefore, we can conclude that the previously illustrated sight-lines are in the main correct, and the site of Rose Cottage would have been wholly obscured by the Wesleyan Hall (school?) in Rae’s 1849 panorama. M4721 Map of the City of Newcastle, County of Northumberland, NSW, July, 1860. (The Bingle map) showing the site of present day 51 Bolton Street as occupying allotment 37 owned by Simon Kemp. A few years ago I compiled a couple of incomplete panoramas of Newcastle East, using photos from the early 1870s and 1897 in Cultural Collections and State Archives. Some of the images took a bit of juggling because the size and quality weren’t consistent. I have attached annotated copies of the panoramas with particular reference to the site of Rose Cottage which unfortunately is obscured by the Limerick Hotel building in both images (roof line may be visible). The links to my Flickr collection also contain references to the images in Cultural Collections. I have also attached a series of high resolution copies of the some of the basemap overlays from 1818 to 2017, showing the approximate sight lines to the Rose Cottage site. Unfortunately I haven’t yet found a map from 1870s showing building details, just lot boundaries. jgw files are text world files so that the map images can be loaded into a GIS system if required. I can also generate .kmz files for Google Earth – let me know if you would like copies. Panorama from near NW corner of Newcomen St and Church Sts early 18 70s taken from area on eastern side of Christ Church, above back yards of houses in Newcomen St. Date range using date of gaol demolition and hospital construction Flagpole on extreme right of image may be identifiable in other contemporary images. Building used for Limerick Hotel prominent. Photos courtesy of UON Cultural Collections. It was originally published in the Illustrated Sydney News of April 1875 and contains a key identifying the buildings and important features of the landscape. Newcastle, originally published in the Illustrated Sydney News of 8 April 1875. David Campbell replies to Charles Martin stating: I think you are right about the Rae photo showing the cottage opposite the old Denominational School (building with bellcote above gable) on the site of the former Newcastle East Public School/Court House annexe/flats. I think I may just be able to make out the roof of the cottage above the little dwelling next to the terrace where Grand Hotel now stands. Funnily enough, that little dwelling is referred to in Braggett’s From Convict Era to Modern Times about Newcastle East Public School. I have looked at one of the Cultural Collection’s overlay maps of Bolton (should be Boulton) Street overlaying the Armstrong map (late 1820s I think) across what is there now; I think Toll’s may be built on the footprint of an older building shown in the Armstrong map; this may have been a rather frail dwelling, whether brick or just brick nogged behind weatherboards, but with pit-fired bricks that would have been very friable due to low/uneven firing temperatures, so despite lime-washing would not have had longevity unless protected by all-round verandah. If you visit the site http://www.environment.nsw.gov.au/heritageapp/ViewHeritageItemDetails.aspx?ID=2170147 you will see interiors and exteriors. The upstairs window, squat chimney makes one think that the place could date from early 1830s, as after the arrival of the Australian Agricultural Company in about 1830 opened their well-capitalised A Pit colliery it brought new prosperity (and therefore potential for brick buildings such as Toll’s) to a town that had been descending into dilapidation after the relocation of the convict station to Port Macquarie, with just the convict public works gang/small scale commercial activity/ a few convalescents attracted by the seaside providing the main economic activity. It was after the relocation of the convict station in 1826 or whenever it was that the rather frail buildings of that period were generally abandoned; the few that had some longevity were the stockade/convict hospital at the lumberyard; the hospital on the later site of the Royal Newcastle hospital; and the gaol at what is now Parnell Place. REPORTS. From the INSPECTOR OF NUISANCES, reporting on Mr. Finney’s letter, dated 29th ult., that he visited Mr. Finney’s unoccupied land in Bolton-street, near the Limerick.Hotel. He saw a pool of stagnant drainage water lying there, which had been .carried thither by a brick culvert crossing under the lane from premises above, and terminating at the southern boundary of the allotment. The culvert discharged the whole of the drainage into the land. Mr. Finney asked the Council to abate a nuisance which existed upon his own premises, and over which he had full control. He should either proceed against the parties offending, or at once stop the nuisance running on to his ground. The only way for the Council to interfere was by proceeding against Mr. Finney for having unclean premises. If the nuisance was not at once suppressed, the place alluded to by Mr. Finney, as having been drained in accordance with the City Engineer’s plan was the allotment upon which Mr. Finney lived, and had no communication with the nuisance above referred to. Alderman KEIGHTLEY moved – “That a copy of the report be sent to Mr. Finney, and that he be requested to see to the matter.” He (Aldermen Keightley) was sure Mr. Finney had no desire to offend his neighbours or to break the by-laws. Alderman CREER said the engineer might prepare a plan to take away the whole of the drainage; to which the property-owners might agree to subscribe. Alderman CnAr. !iAN said some of the .property-owners had once refused to sub-scribe to the work. Mr. Finney had filled iin his land and blocked it up, and if all the neighbours would agree to do this there would be no difficulty in draining the place. He thought it would be as well if the property-owners in the vicinity were asked to confer with the Drainage Committee, and he moved a motion to this effect. Alderman KEIGHTLEY withdrew his motion and concurred. Russell Rigby, has also located some information about the former owner of Rose Cottage. Joseph Finney (c1830-1913) There are references to Joseph Finney in the Newcastle Morning Herald in the 1870s working as a carrier with 2 or 3 carts around Newcastle. During the 1880s are more mentions in articles, council reports and advertisements about houses for rent and land for sale in Bolton Street, Church Street Bull Street and Wickham. He stood unsuccessfully for Council in 1888, and in the nomination he was described as a property owner of Bolton Street. He and his wife Elizabeth moved from 65 Bolton St to High Street between 1895 and 1900. He died in 1913 aged 83 at High Street, and his wife died the following year. The Rose Cottage site and surrounds in 1886, are mentioned in a report on Trove of the Licencing Court proceedings regarding the Limerick Hotel. The Limerick Hotel was on Bolton Street, on the southern side of of the lane leading into Rose Cottage. The Mahlstedt & Gee plan shows that Rose Cottage and another building were owned by Joseph Finney, who gave evidence at the Licencing hearing, against the renewal of the licence. I AM instructed by Mr. Joseph Finney to draw your attention to the fact, that unless you proceed with the erection and completion of his FOUR HOUSES in Bolton street, Newcastle, in accordance with your Contract, within the NEXT SEVEN DAYS from date, he will enter upon and take possession of the works, and employ others to complete the same at your risk and expense, using any materials delivered on or near the premises for the said works. There are numerous advertisements in the Newcastle Morning Herald and Miners’ Advocate for Finney’s properties for sale or rent – some of these will be for Rose Cottage, but more study will be needed to see if it can be identified. Closeup of the Lyceum from the “Newcastle N.S.W.” Illustrated Sydney News 27 June 1889. Panorama from near NW corner of Newcomen St and Church Sts. Left photo appears to be from same verandah, maybe slightly north of centre and right photos strong shadows on centre and right photos, left photo has very diffuse shadows, so overcast but probably afternoon similar to other photos – can’t be sure of time on Customs House clock, but may be 3:50. I have used the sight line over the northern edge of the Lyceum Hall to the Customs House tower, as well as the property boundaries in Newcomen St to locate the left image. There is a possibility that the left image was cropped from a wider image when printed, so the gap in the panorama may be reduced if a different version of the image can be found. This panorama is extremely useful because it puts buildings on the detailed footprints surveyed in the 1890s Waterboard plans, and shows the developments in Bolton St around the Rose Cottage site. According to Dr Ann Hardy, Toll Investments Pty Ltd purchased the dwelling in the 1950s, restoring it during the 1970s and 1980s, and gifted it back to the city. I listed it for the NT in the early 1980s or late 70s. It was then believed to be Newcastle âs oldest, between 1828 and 1832. We didn’t know then about the surviving c 1819 fabric at (now demolished) Kirkwood, Church St. So the answer is yes. The answer is “NO” plain and simple, based on research not opinion. The same article provides, from witnesses interviewed at the time, that the land was vacant prior to Finney building his house. The vacant land Finney bought was part of the many lots offered for sale in the Church, Bolton and King streets area during 1857. The two terrace houses (left side of laneway almost opposite of Finney’s house) that Finney had problems with (Newcastle Herald 05 March 1887 http://nla.gov.au/nla.news-article138817939) are shown on the Mahlstedt & Gee (1886) map. The other four terrace houses (Newcastle Herald 10 August 1887 http://nla.gov.au/nla.news-article132504174) are not shown on the plan but are visible in photographs as being located to the north west (left side of laneway entrance) of Finney’s cottage and two houses facing Bolton street. I cannot explain why the Mahlstedt & Gee map does not show the buildings but they are shown in photos as being constructed on Finney’s Land. Thanks for providing those references. The c1819 fabric was nothing more than the remains of the old parsonage/deanery. The building was demolished around 1902, according to the archeological report. As the “Kirkwood” reception building, recently demolished, was built using some recycled sections of the older parsonage the sum of the parts of the old parsonage building would not sensibly support the “new” Kirkwood building as a whole to qualify as being convict built. From what I have seen in the archeologically report it is no surprise that the Office of Environment and Heritage did not consider the site/building worth preserving. Interesting. I thought it looked too sturdy and salubrious to date back to the penal station. Has Charles been able to identify ownership/occupancy of any of the cottages built prior to 1822? I have the odd reference to ownership or exchange of huts but nothing to identify locations. Thank you I will. It would be so great if we could identify where particular hut’s were – like Mrs Young’s Disorderly House or the ‘best Huts and gardens’ Wallis allocated to his most skilled tradesmen. Or the house Purcell thought they should buy for married soldiers and so on. I am interested in the spatial arrangements of the settlement to see how the Young’s and the many convict smugglers managed to avoid direct surveillance. It would give real life to the recent VR project too if we could place people and their activities on the street map. How interesting. I thought it looked a bit sturdy to be from the Penal Station years. Has Charles been able to identify occupancy /ownership of specific huts prior to I822? I have the odd reference to ownership and exchange (which surprise me) but nothing that rates to specific locations. Nor even anything that gives a clear picture of government v private ownership. The building was constructed in 1857.